The Scotland Bill was published on the 28th May by the UK Government and is now on its hurried passage through the UK Parliament. (4) It is intended to implement the Smith Commission agreements. Clause 31 of the Bill that deals with the Crown Estate, however, completely fails to do this and needs to be re-drafted. 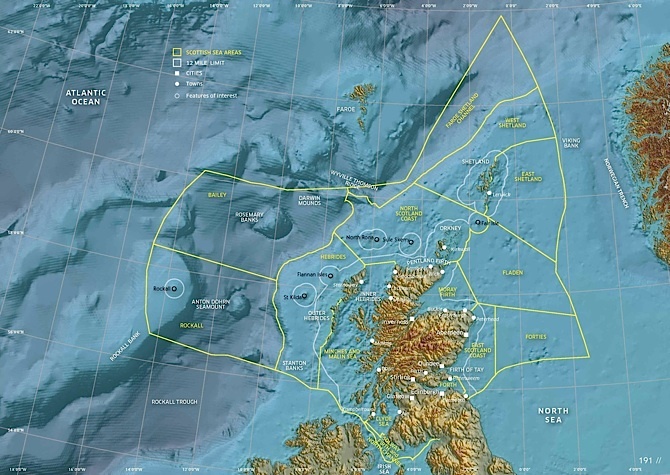 The Crown property, rights and interests that make up the Crown Estate in Scotland are legally and constitutionally distinct from those in the rest of the UK, because they are owned by the Crown in Scotland and defined in Scots law. Scotland’s Crown property rights are of ancient origin and continued to be administered with their revenues in Scotland following the Union of Crowns in 1603 and the Treaty of Union in 1707. Some of these Crown rights continue to be managed in Scotland by the Scottish Government and Crown Office. However, the administration and revenues of many of Scotland’s Crown property rights were transferred from Edinburgh to a government department in London in the 1830s. That department and its successors, were the predecessors of the current CEC. The Scotland Act 1998 devolved legislative competence over Scots property law, including Crown property rights, to the Scottish Parliament. The first Scottish Parliament, for example, used this legislative authority to abolish the Crown’s ultimate ownership of land in Scotland under feudal tenure. However, the reservation of the management of the Crown Estate in the Scotland Act, precludes the Scottish Parliament from being able to legislate over the rights managed by the CEC and also means that the CEC is not accountable to either the Scottish Parliament and Government for its operations in Scotland. Implementing the Smith Agreement would complete the devolution process started in 1999 and bring the rights and the management together under the legislative competence of the Scottish Parliament. The Smith Agreement to devolve the management and revenues of the Crown’s property rights should be straightforward to implement in legislation. removing clause 3(3)(a) that reserves the revenue from the Crown Estate in Scotland. Removing these two reservations would mean that responsibility for managing the Crown property rights that currently make up the Crown Estate in Scotland, automatically falls to the Scottish Parliament. Appropriate legislation also needs to cover some consequential amendments to other legislation, in particular to the Crown Estate Act 1961 to reflect that it would no longer apply in Scotland. In addition, the legislation requires some procedural provisions dealing with the transfer date and process. Unfortunately, clause 31 in the Scotland Bill manifestly does not implement the Smith Agreement. The clause does not devolve the responsibility for the management of the Crown Estate in Scotland to the Scottish Parliament. Instead, the clause delegates existing functions of the CEC as a statutory corporation to Scottish Ministers or others transferees through a Treasury ‘scheme’. The Smith Agreement to devolve responsibility over the Crown Estate in Scotland reflects the longstanding agreement in Scotland over this matter and it should be straightforward to implement through the Scotland Bill. Why then does the existing clause 31 fail to do this? This blog argues that this current state of affairs has arisen because of the degree of influence that the CEC has had on the nature of clause 31. The sequence of Committee inquiries and reports into the operations of the CEC show how CEC corporate policies have been aimed at maintaining it as a UK organisation. IN 1998, the CEC declined to participate in the devolution process in the way that the Forestry Commissioners did (and have continued to do). The starkest example, however, was in 2001/02 when, against the flow of devolution, the CEC ended its management of the Crown Estate in Scotland as a separate management unit with its own manager and financial accounts, so that the CEC could assimilate its operations in Scotland into those in the rest of the UK. (10) The current clause 31 with its stretching and twisting of the Crown Estate Act 1961, can be seen as the CEC’s latest move to try to retain the Crown Estate as a UK wide estate. The Smith Agreement patently does not say this. It says that responsibility for management will be devolved to the Scottish Parliament. That is an entirely different matter from a mere delegation of functions to be exercised within the framework of continuing reserved powers. The Scottish Government’s initial response to the Scotland Bill recognises the need to re-frame clause 31, so that the clause removes the reservations in the Scotland Act 1998 over the management and revenues of the Crown property rights in Scotland forming part of the Crown Estate. (12) The terms of the Scottish Government’s proposed alternative clause 31 still suffers from some other weaknesses. However, it is to be hoped that all the parties involved in the Smith Commission will recognise that the issues over clause 31 are not party political. Solving this problem is a simple matter of re-framing the clause in a competent was so as to implement the Smith Agreement in as straightforward a manner as possible. See Crown Estate Review Working Group Report and Scottish Affairs Committee Report. For example, the Bill amends the Civil List Act 1952 to obligate the payment of all Crown revenues to the Scottish Consolidated Fund. Decentralisation to, for example, to harbour trusts will be constrained by a continuing legal constraint to hand over all revenues to the Scottish Government. A very interesting article. Its about time that all this Crown Estates nonsense was swept away and their land and assets transferred to public ownership without compensation. We are no longer living in the dark ages of medieval feudalism, after all. Down south I would also take back all land held by the Duchies of Cornwall and Lancaster. In fact once you start this process there is no end to it, and I shall be very interested to see how Scotland deals with this problem in future, together with its attitude in general towards monarchy. Recent celebrations about Magna Carta indicate that in the absence of a proper constitution there is a bottomless pit of myth and legend about these ancient agreements, nearly all of which were constructed merely to protect the interests of the rich and powerful of their day. It would also be very interesting to know who owns what these days. It is a disgrace that the so-called Land Registry only lists limited details of land and freehold tenure. Apart from that I assume that the Crown Estates and/or the monarchy still exercise rights over mainland and offshore development for gas, oil or anything else. Its about time all that is sorted out properly for the benefit of the people. before. Reminds me of a pit bull when someone tries to take away it’s bone. are slowly loosening their grip. Just needs to get quicker to break it. An invaluable and splendid article that is especially ‘apropos’ and deserves wide circulation among our legislators. And one that reminds us what a service could be done if the same close textual exercise was repeated by Bella Caledonia contributors with special expertise in various specialist areas, applied across a wide range of the Scotland Bill’s clauses. I bow to Andy Wightman’s knowledge of the Crown Estate, but I wonder whether the Smith Commission interpretation of clause 31 may in any case reflect the excessive speed with which the Commission undertook its work, which appeered to me at least to be drafted a little ambiguously when viewed in the context of the Wightman analysis. I suspect that relatively little in the Smith Commission will not be subject to Westminster interpretation and drafting that will be deliberately tendentious, prevaricating or downright obtuse; but in any case will tend to exploit any ambiguity in Smith in order to exploit or further (my not reasonable assumption of) Westminster’s determination to preserve as much of the ‘status quo ante’ that it can “get away with”. Hence my feeling that Bella Caledonia could provide an invaluable service to the public as the Bill proceeds through Parliament, in providing systematic and closely reasoned analysis of each key clause of both the Scotland Bill and the smith Commission. The posh unionist boys (and gels) will continue to carve up pieces of institutional Scotland so long as we the people of Scotland let them. Thankfully their control over our people, land and institutions appears finally to be coming to an end, from the CEC, to Justiciary, to universities, national museums/galleries, and even the tattoo. As noted elsewhere this week with respect to recruitment bias in the corporate sector, these public institutions still select managerial people on the basis of their school, university, even military background. Their aim is to perpetuate the unionist mindset, control and class dominance over the Scots masses. Thankfully at least half of Scots now get the picture, thanks to articles such as this from Andy Wightman and to Bella and other informed sites. The purge is a-comin, an no afore time tae. Dont be fooled into thinking all is rosy , that the people have any say on the land , despite SNP promises , they bloody dont , SNP cant blame Westmonster for the following Case….which in no doubt is also repeated elsewhere. Take the LDP in North Ayrshire , specifically Stevenson and West Kilbride/Seamill.Specifically land that the community dont want to be housing , and had prevented pre LDP. There are many mutterings about underhand deals , ignoring the community and official bodies , family nepotism both in the SNP itself and at NAC council employment , thats perhaps alowing a cover up….something that the SNP once called out Labour held councils and the national party for doing. A Corrupt council , or is it multi party Councillors on the LDP committee being unaware of the truths within the HNDS and other vital documentation , yet still making decisions to allow the LDP without full information being made available to them? SNP and NAC are ignoring their own mantra on LOCAL people deciding on land use , through using their LDP as a war tool at council level if the community says NO. They are ignoring rural development policies on not using farmland when other land is available , circa 35 acres at the time in an urban setting owned by NAC themselves , that they couldn’t find any buyer for with planning available , yet the committee Councillor members were not made aware of it at the time! Those the SNP supposedly fight against , LANDOWNERS , for the communities through empowerment bills , have the SNP deliberately made backdoors for them to exploit? At least this case , the SNP and NAC , have instead allowed the use of ever dwindling prime grazing land for housing under the guise of affordable housing . Insultingly , the developer can choose to use another site for the affordable housing in an urban setting elsewhere , which is part of the Hollyrood LDP legislation itself , keeping the development executive housing ! This is something we would expect of the TORY party , not our SNP. The inclusion of the Area into the LDP will break the local School which is already full , which they , NAC , an SNP led council already know. This only serves to remove a higher than average grade , local , full to bursting school , and resite miles away from the Local community itself .Or it means class sizes increasing breaking another core SNP policy , and as already suspected , is the long term council plan for relocating the local school outwith the area anyway , using this as a backdoor argument for doing so.In the process increasing Traffic , commutes , school runs and importantly Co2 levels breaking targets. The inclusion of this land will break the local GP and dentist , already at capacity In West Kilbride , which NAC has failed to apportion ANY car parking , instead has put double yellow lines in front of both of them.Is this the only GP surgery in Scotland without any parking , or indeed one single disabled parking bay?Another core policy of the SNP broken , by themselves , increasing the load on GP surgeries. IF this is the state of things to come , with SNP led councils ignoring their own policies , as well as those from Hollyrood , then sadly the writing is on the wall for the SNP. If they cant do their own mandates , to empower communities , or indeed ensure that Local Councils and Hollyrood itself know and enact them….then what hope for bloody independence? This from a pro independence supporter , SNP supporter , whom has had their eyes opened.I suspect you wont post this ,but the SNP need policing from outside the party , that is if we don’t want it to fester further , thus opening the gates to its demise.